Fine Italian cuisine in an atmosphere of wood, plants & murals. Extensive wine list. New Sushi Restaurant in Montreal! 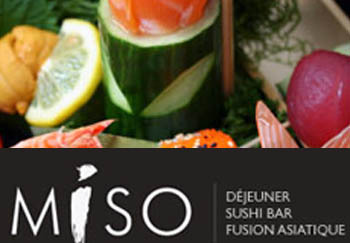 Try the sushi, Asian fusion or even breakfast at Miso! Miso's three bright, airy floors allow guests to experience three different zen-like dining atmospheres. Warmth, luxury and complete comfort. Terrace is now open! Montreal's Irish Pub with live entertainment, 18 imported beers on tap, Pub Grub and Irish sports on Satellite. Neighbourhood pub in Monkland Village with the flavour of the old country. New location downtown & Prince Arthur St..
New sophisticated pub & grill. Live entertainment, extensive menu, Irish & British beers. 2 large terraces. Restaurant Traiteur Oishii Sushi located in the Anjou/Nouveau Rosemont district of Montreal serves fine cuisine using the freshest of ingredients. Discover the fresh and delicious cuisine at Traiteur Oishii Sushi. Well known meeting place on famous Crescent St. Bars, restaurant, dancing, games room. Fine French cuisine in historic house. Well known steakhouse in renovated stables. 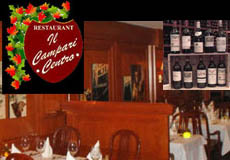 Long established restaurant specializing in fondues, raclette, steak and seafood. Free shuttle & parking on Fridays & Saturdays. Upscale disco, lounge, restaurant. Awesome view. Beautifully decorated pasta emporium and bar. Mexican restaurant, bar and lounge, best tacos, enchiladas, burrito, margaritas, mojitos, daquiris and much more...Supper is only the beginning. Twelve choices of steak cuts including the famous rib eye (Delmonico cut), veal and roast prime rib. Wide selection of fresh fish and lobster from the market and an outstanding wine list, Live jazz. Reservations recommended. Swiss and European food. Raclette a specialty. Website French only! Charming bistro serving pasta and pizza in the heart of Little Italy.